This is the seventh installment of The Rationalist, my column for the Times of India. All around me, the air is filled with the anguished groans of cricket purists. England scored 481 against Australia a few days ago in a one-day match at Trent Bridge, despite a slowdown in which no boundaries were hit in the last four overs. In their previous ODI at the venue, against Pakistan, they had made 444. And it isn’t just this venue: everywhere, it would seem, mishits are going for six, record scores are being posted, and bowlers are settling down in bathtubs to slash their wrists. The purist lament is simple: for a variety of reasons, the balance between bat and ball has been upset. Heavier bats, shorter boundaries, bad regulations, the malign influence of Twenty20 cricket. “In the good old days,” my friends declaim in sophisticated accents, “cricket was not a spectacle but a contest.” Also, though they do not say this, petrol was two rupees a litre. First up, let’s consider why the balance of the game has shifted towards run-scoring. Heavier bats are just part of the reason. The main cause is that batsmen have been forced to develop new skills because of the changed imperatives of T20 cricket. Having ten wickets in hand but only 120 balls in an innings means that the value of a run goes up, the value of a wicket goes down, and the cost of a dot-ball is immense. This mandates greater aggression. Batsmen have thus developed a wider array of skills than previous generations needed to. (Consider AB deVillier’s 360-degree game.) Fielders are now better than ever in the past, because each run saved is that much more important. And bowlers have also adapted. That old cliché of T20 cricket being a slugfest where you can replace bowlers with bowling machines is nonsense. Bowlers, who once focussed on restricting runs, have realised that the best way to keep the score down is to take wickets. Attack is the best defence. Modern spinners like Rashid, Chahal, Kuldeep are not scared to flight the ball in search of wickets, in contrast to the flat ODI spin bowling of the past. The top teams in this latest IPL were the ones who bowled to take wickets, not to restrict: consider how MS Dhoni used his CSK fast bowlers. These skills have migrated to the other forms of the game—and have enriched them. The writer Gideon Haigh, in an episode of my podcast The Seen and the Unseen, once mentioned why he found the 2015 ODI World Cup fascinating. 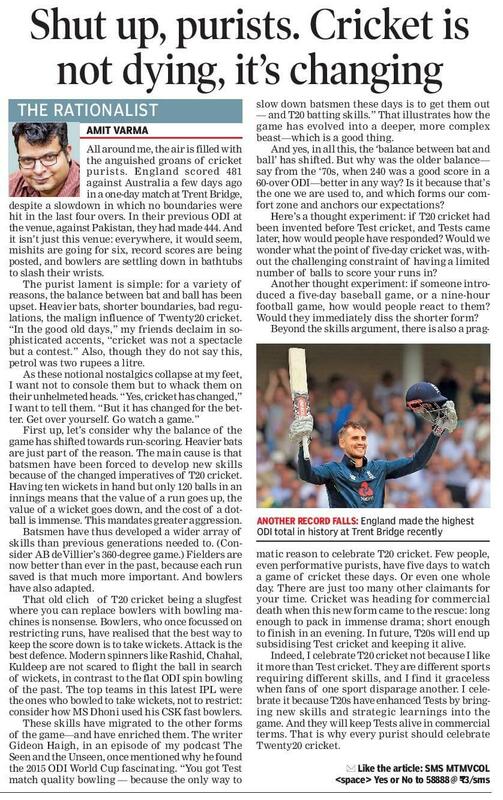 “You got Test match quality bowling—because the only way to slow down batsmen these days is to get them out—and T20 batting skills.” That illustrates how the game has evolved into a deeper, more complex beast—which is a good thing. And yes, in all this, the ‘balance between bat and ball’ has shifted. But why was the older balance—say from the ‘70s, when 240 was a good score in a 60-over ODI—better in any way? Is it because that’s the one we are used to, and which forms our comfort zone and anchors our expectations? Here’s a thought experiment: if T20 cricket had been invented before Test cricket, and Tests came later, how would people have responded? Would we wonder what the point of five-day cricket was, without the challenging constraint of having a limited number of balls to score your runs in? Another thought experiment: if someone introduced a five-day baseball game, or a nine-hour football game, how would people react to them? Would they immediately diss the shorter form? Beyond the skills argument, there is also a pragmatic reason to celebrate T20 cricket. Few people, even performative purists, have five days to watch a game of cricket these days. Or even one whole day. There are just too many other claimants for your time. Cricket was heading for commercial death when this new form came to the rescue: long enough to pack in immense drama; short enough to finish in an evening. In future, T20s will end up subsidising Test cricket and keeping it alive. Indeed, I celebrate T20 cricket not because I like it more than Test cricket. They are different sports requiring different skills, and I find it graceless when fans of one sport disparage another. I celebrate it because T20s have enhanced Tests by bringing new skills and strategic learnings into the game. And they will keep Tests alive in commercial terms. That is why every purist should celebrate Twenty20 cricket.